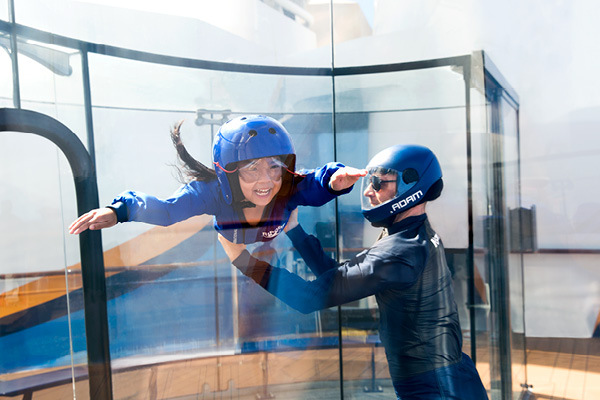 Only Royal Caribbean® can blow the doors off ordinary and take cruising to new heights. Onboard you’ll find world-class entertainment, top-notch food and exhilarating activities for all – things that make the difference between a good holiday and an incredible one. With 26 ships visiting 6 continents, 64 countries and every major sea, Royal Caribbean® have got the globe covered. This is not your average family holiday. The little ones get Adventure Ocean® and exciting aqua parks like Splashaway Bay℠. You and the bif kids get the FlowRider®, RipCord® by iFLY® and the Rock-Climbing Wall. And everybody gets soaked in buckets of fun in the pools. Complimentary Dining: Main Dining Room, Windjammer Cafe, Sorrento's Pizza, Solarium Bistro and more. My Family Time Dining℠ : Kids enjoy their meal within 45 minutes of the first Main Dining Room seating, before heading to the evening's activities. No room, space or corner can be accused of being ‘plain ordinary’ on a Royal Caribbean® ship. Whatever your budget, every inch is designed to wow you. And that includes staterooms. Whoever you’re cruising with or whatever your priorities are, there’s a stateroom set up for you. Bringing your entourage? Royal Caribbean offer a number of interconnecting staterooms that are perfect for families – they’ve thought of all the details so you don’t have to. Savour the seaside and snapshots of landscapes from shore to shore in an Oceanview stateroom. Or enjoy real-time outdoor sights in an Interior Virtual Balcony℠ stateroom onboard Ovation of the Seas® and Voyager of the Seas®. Claim your slice of paradise with balcony views just outside your door. 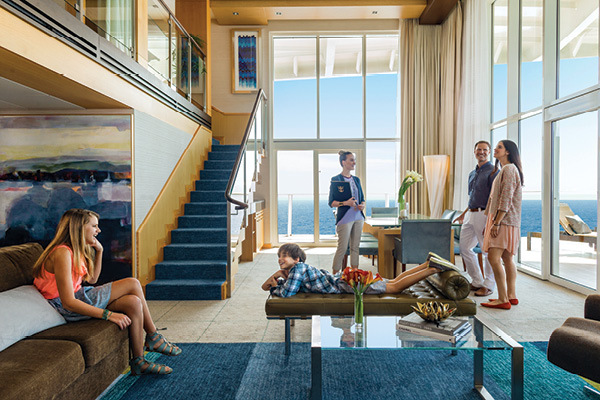 Interconnecting balcony staterooms are a great way to keep everyone together and get a little more space at the same time. From the Junior Suites to expansive Loft Suites, the whole family can travel in style with more space, comfort and private balconies. Plus, enjoy a variety of exclusive perks like priority boarding, complimentary concierge service and more.